Shrewsbury Town earned a hard-fought point at Peterborough with a late goal from ex-Posh striker Tyrone Barnett. Posh started well, with Harry Beautyman heading over before Marcus Maddison and Erhun Oztumer spurned chances. Conor Washington then broke the deadlock for Posh, finishing low into the corner from the centre of the box. Shrewsbury's equaliser came when Ben Alnwick palmed a long-range shot into the path of substitute Barnett, who finished into the bottom corner. 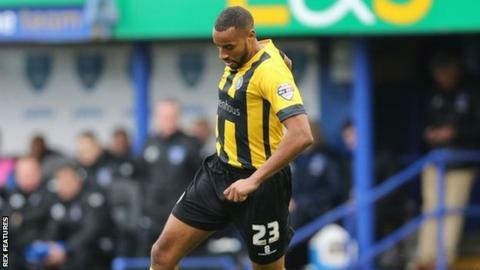 Barnett, who cost Peterborough a then club record seven-figure fee from Crawley in 2012, joined Shrewsbury in February. He has now netted six times this season, but this was his first in two months, to help lift Town to 18th, a point clear of trouble. "You always hope that players who come back to their former club can score. It doesn't always happen but I was delighted for Tyrone Barnett to do that. "It was a bit of a kick in the teeth to concede as we were enjoying a good spell. We gave away possession and they found the back of the net. "Peterborough are a good side, but you don't just defend with your back four. All the way through we needed to get the shape right. We knew where the threats were to have any chance of winning." Match ends, Peterborough United 1, Shrewsbury Town 1. Second Half ends, Peterborough United 1, Shrewsbury Town 1. Corner, Peterborough United. Conceded by Scott Vernon. Attempt missed. Souleymane Coulibaly (Peterborough United) right footed shot from a difficult angle on the left is too high. Liam McAlinden (Shrewsbury Town) is shown the yellow card for a bad foul. Callum Elder (Peterborough United) wins a free kick in the attacking half. Foul by Liam McAlinden (Shrewsbury Town). Attempt missed. Conor Washington (Peterborough United) right footed shot from outside the box is high and wide to the right. Attempt blocked. Jon Taylor (Peterborough United) right footed shot from the left side of the box is blocked. Attempt saved. Tyrone Barnett (Shrewsbury Town) left footed shot from the right side of the box is saved in the centre of the goal. Attempt missed. Souleymane Coulibaly (Peterborough United) right footed shot from the centre of the box is just a bit too high. Attempt saved. Conor Washington (Peterborough United) left footed shot from the centre of the box is saved in the centre of the goal. Corner, Peterborough United. Conceded by Anthony Gerrard. Attempt missed. Tyrone Barnett (Shrewsbury Town) header from the centre of the box misses to the right. Corner, Shrewsbury Town. Conceded by Michael Smith. Souleymane Coulibaly (Peterborough United) wins a free kick on the right wing. Attempt missed. Erhun Oztumer (Peterborough United) left footed shot from outside the box is just a bit too high. Goal! Peterborough United 1, Shrewsbury Town 1. Tyrone Barnett (Shrewsbury Town) right footed shot from the centre of the box to the bottom right corner. Assisted by Sullay Kaikai. Attempt blocked. Tyrone Barnett (Shrewsbury Town) right footed shot from outside the box is blocked. Foul by Andrew Fox (Peterborough United). Sullay Kaikai (Shrewsbury Town) wins a free kick in the attacking half. Substitution, Peterborough United. Souleymane Coulibaly replaces Marcus Maddison. Substitution, Shrewsbury Town. Liam McAlinden replaces James Collins. Attempt saved. Sullay Kaikai (Shrewsbury Town) left footed shot from the left side of the box is saved in the centre of the goal. Foul by Marcus Maddison (Peterborough United). Anthony Gerrard (Shrewsbury Town) wins a free kick in the attacking half. Jon Taylor (Peterborough United) is shown the yellow card. Foul by Callum Elder (Peterborough United). Liam Lawrence (Shrewsbury Town) wins a free kick in the defensive half. Attempt saved. Andrew Fox (Peterborough United) left footed shot from outside the box is saved in the top centre of the goal. Substitution, Shrewsbury Town. Tyrone Barnett replaces Jordan Clark. Corner, Peterborough United. Conceded by Mark Halstead. Attempt saved. Marcus Maddison (Peterborough United) left footed shot from outside the box is saved in the top centre of the goal. Substitution, Peterborough United. Andrew Fox replaces Harry Beautyman. Abu Ogogo (Shrewsbury Town) is shown the yellow card for a bad foul.